I haven't been fortunate enough for an alien or a god to make themselves known to me. Many others claim to have been lucky enough to have made contact with these fine fellows but I haven't and I don't think I actually ever will. Does having that attitude mean I'll be forever too cynical, skeptical and proud to admit to it when I finally do 'get a touch from the Lord'? No, it doesn't. You see, ever since I saw an extinct Tasmanian Tiger walking around my campsite last year I haven't stopped telling people about it. Despite everyone's smirk and a statement from the state meuseum, I'm certain of what I saw. If I do see a Grey in my backyard or an angel at my window, don't worry, I'll be door knocking and blogging like an idiot. Thing is... I used to go door knocking espousing my religious beliefs to strangers and truly believed that I spoke a magic language that only God could understand. I WANTED to believe it and I allowed myself to. It's bloody amazing what we'll allow ourselves to be duped into believing. I WANT to believe in aliens too, because I think life would be more exciting with them around. Similarly, I think swimming in the ocean would be more exciting if there were mermaids in the water too, but I truly doubt they're in there. I think it's a neat idea to have a magic kingdom to go to after we die, but it's a really stupid idea when you think about it, isn't it? I don't believe in heaven, mermaids, aliens or any fictional crap. I do, however, have a deep fascination for crop circles. They just seem to complex for normal people to have made. They are mysterious and they make me wonder. It's the same sort of wonder I feel after watching a good magician pull off a good trick; they suspend my belief for a moment, but I know it's a trick. We humans are good at tricking each other, and the tricksters are competitive with it. We can build pyramids and do incredible things... we can do crop circles. I found the following explanation for Crop Circles and it sits well with me. 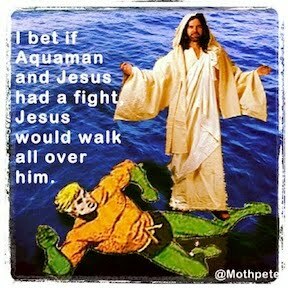 I can now go back to believing in the believable. "It is the scientific viewpoint of the Circles Effect Research Organisation (CERES) that crop circles which are more complicated than simple round ones are either hoaxes (deliberate pranks) or 'experimental hoax-like creations' for whatever purpose (e.g. advertising, film-making). The teams of circlemakers who produce the complex designs become ever more experienced at executing arrays of circles which are sometimes planned at length over winter. On some occasions farmers have colluded with the circlemakers to facilitate their efforts. 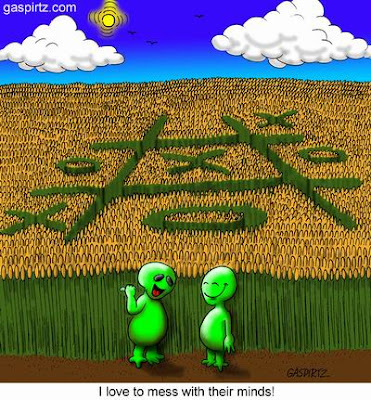 Reported cases of complex crop circles as having appeared 'in a matter of minutes' are spurious --- and are the result of the field having been inadequately observed previously."